More often than not, the rehearsals are the most fun. When we are all a little more chilled out and the heat starts getting to us only as it nears the time of the actual event on stage, but until then its all fun and laughter. At other concerts that I have been part of, the standard quip would be to say that the final rehearsal will be the concert itself. Also, some onstage mess ups, that perhaps only those that the artiste knows, mostly the musicians and co-artistes would also know and rarely the audience knows. The rehearsals for Vinnai Thaandi Varuvaaya's audio launch had us all spend considerable time, jamming, working out how we could perform the songs - especially since it would be the first time people would listen to it, there was some pressure there with a lot of joking and good humour thrown in. Gautham sir would be present for every rehearsal session. Early. He already knew all the lyrics, everyone's portions, entries, who would sing where, by heart and sang along with gusto. I was suggesting he should sing sometime, though he already has in Vaaranam Ayiram, when the title cards play. He sounds good I think. Also, once we had set the order for all the songs and we would repeat it for the 2nd and 3rd times for reinforcement, Gautham sir gave the cues on who should sing when and where right after the first time. For me, it was something I had never seen a Director do. He gave his inputs on how the unplugged versions would be presented even as we put it together under Srinivas sir's guidance. Blaaze anna came up with this rap portion in Omana Penne that you won't find in the album. On Day 1 of the rehearsals, Omana Penne was the first thing that was set. While Srini sir and Benny were discussing how to come in to the song and while it was being put together, Blaaze Anna came up with this "million in one" lines and I was grinning like a Cheshire cat. Every other song fell in place too. There was this one session where Rahman sir had heard the entire unplugged version in London, for which I was not present as I was traveling from Kuwait to London. So there was no opportunity for me to meet him until we got on stage that evening at BAFTA. That was unsettling as well for me because his input before the show is the most valuable one. And I had no way of getting it. And his being there in the first row and watching us was a very jittery feeling for me. I think it was the first time that I was performing with Rahman sir in the audience. The second time, also, with the audio launch in Chennai. I remember before all of us got on stage we were a bundle of nerves. And the guys kept saying it feels so different because the air is so formal. All this suit and tie and coat... they kept saying. And they said it was because of that attire they felt nervous. Before we got on stage we formed a circle, held hands and Alphonse sir said this most beautiful prayer. I was so touched. It was one of the most sincere prayers I had ever heard or seen in a while. It did make a difference to how we felt. But I didn't loosen up until Hosanna was over. I joked with Srini sir later, that at every such momentous occasion, he is the opener. Even at the November Fest concert last year, when the curtains went up, he said that this is one of the times when the artiste is in awe of the audience and it does not help to be the first person to sing. Because that's when the entire sound systems and everything will be adjusted or readjusted. No matter how many sounds checks, Murphy's law is always at play. For that matter the audio engineers at London were downright brilliant. They set up the systems in about an hour. And yes Srinivas sir opened with Hosanna. And of course Srini sir opened with Hosanna. I am trying to figure out, why it takes a while for me to find my bearing on stage especially with how I hear my voice. It takes at least a while to settle down and also because for the kind of songs that I have sung, the throw changes. Like for example between a Mayya Mayya, or a Miss you Da or a Sahana, singing them back to back in a show seems to be the engineer's nightmare. Whispery to husky to downright throwing my voice the way it can be heard to the last row without a mic is not something that a guy would like I guess. I might have to get this sorted too. I realized that I had met Simon Webbe (of the Blue boy band), who had been kind enough to walk up to me and say that I have an awesome voice and said something like, "I didn't even know those notes existed.. you are an amazing singer". I figured he was a musician but I didn't recognize him but the next day, Ravi of the VTV team asked me whether I had met Mr Webbe. And I asked Who? And Ravi said "he wanted to meet you." Then I came back home, all the way back to Chennai that is, googled and was like ack!! Yes I was polite and all, but it would have been nice if I had known his work and who he was. Ah well. Until we were called on stage we were peeping through the door to see what was happening and apparently the audience was loving what Gautham sir was saying. We heard a lot of laughter. And then we were called on stage one by one. Srini sir had said that singers should be invited to audio launches as a norm but this has become an exception. And perhaps because Gautham sir is into music he treated us all so well. And made us feel special. Rahman sir made a rare display of his sense of humour on stage after everyone had expressed their thanks, Rahman sir said "I want to thank my wife. I wanted to wear this tie but this (collar) was too tight, And she helped stitch this button here which made it possible to wear the tie. So I want to thank my wife". Some smart alec later called out to her "Great job with the button". This performance onwards I was making an effort to smile while singing. I had heard so many people tell me to do that, including my mother. Of course even I don't have the wisdom to take it the first time when mom tells me. And now people ask me if I was smiling throughout the show because I forgot the lyrics. Hehe.. Nice. But should be sticking to this and making a few more changes on my performance side as well. I remember Devan remarking, perhaps during the rehearsal in Chennai before everyone took off to London, that more than the show, the rehearsals is what we would all remember the most. Devan is perhaps the funniest guy I have ever met. Tremendous sense of humour, great timing and the anecdotes he had to share had all of us in splits. I remember this time, when I had just met Devan and Harish Raghavendra and during the time that we were killing before we had to go on stage, both of them were unstoppable and mom and I were a complete gone case with all the laughing. My voice took quite a while to recover. Just in case you don't know, laughing does no good to the singing voice. Its one of the worst things to do before singing. Which is why Srini sir also told them not to put Devan on the same flight as him and the others. Because we knew we would all have laughed so much that we would have no voice left. And sometimes he made these funny faces while playing the guitar, that we had to physically turn away and look somewhere else while he played his bit. And also, the majority there would speak Malayalam, i.e. Benny, Stephen, Srinivas sir, Alphonse sir, Alaap who joined us for the performance at Chennai and they would ramble off and Devan would say "Cut the Asianet". The quietest person is Blaaze Anna. Doesn't speak much at all. But when he gets up and raps.. oh wow. But perhaps I have learnt more Malayalam than ever thanks to all the time we spent at the rehearsals. But yes, all rehearsal sessions are not happy pappy as this one or as positive. Some are truly painful, emotionally that is or just uneventful. The rehearsals and the performance for this launch was musically gratifying, a thought that all of us shared. And yes, life does show some spring colours. As for today, though it was Pongal, I didn't like it one bit. The day wore high heels, dug them deep in clayey soil and dragged. i am a regular visitor to ur blog but never leave any comments. The reason why i am commenting now is to request you to keelp blogging (i ma not a big twitter fan). Thru all your detailed writings, i can put a face/life/emotion onto the people you describe (like Devan sir). And that brings a smile to me (and to others too i am sure)! So, please do continue blogging however unfrequent you are. Hi, 'Happy Pongal and Mattu Pongal' too ..Just kidding. Not sure why I laughed so hard at 'Cut the Asianet'. VTV rocks I have to say ! Kudos to all of you. I did watch the videos of the audio launch and thought ur voice was pretty stable. I am sooo madly in love with aaromalae... fantabulous songs in VTV... i did notice that u had to sing kalyani menon's portions as well :)... nice effort. great album!! worth the wait!! Yesterday we got the opprotunity of seeing the Audio launch event in Kalaignar tv"s telecast. Part of the rehearsal Shots are also included. we observed tht how the director mr.Gautham was enjoyed the music from his partipation in the singing along with the singers. People like Deven gets pleasant only by seeing smile on others faces. Lol.. I just saw the videos of the audio launch! Being in the US, I am missing all the tv shows and functions!! Aw, heard all songs and VTV is absolutely mesmerizing me!! U hav, as usual done a good job in Anbil Avan!! :) Keep rocking!! Watched the VTV audio launch and at times - i felt that the unplugged version sounds as stunning as the album version itself. i was trying to play both side by side to see how different they were. I think unplugged version sounds more like "the mood" of the lyrics. The tune feels pure there ! Do you think you can do an actual recording of the unplugged version and release it. I'd for sure pay for it ! and i know millions of maniacs like me would do the same. Just the Piano, guitar and the vocals ! Praying for this to happen ! I expect a book out of your experiences! That was a very interesting blog. I did see the videos of the audio launch(VTV) in Chennai and all of you on stage were enjoying every moment. No wonder the final product is also amazing!!! How cool or talkative ARR sir is during the recordings?. Does he make fun, laugh around when he is recording?? Maybe when time permits, it would be great if you can write some memorable moments in ARR sir's studio along with the other singers!! Ganesan: Yes.. Mr Menon is highly involved with the music, he was present at every rehearsal and sang along throughout. Sreekrishnan: True we had a great time putting it together. I am not sure if that would release though I believe Rahman sir said something like that should happen. But not sure if it would come to existence. Thanks so much for taking the time to reply to each one of us. I very well understand you are not at liberty to talk about everything :) And since I have only recently started visiting your blog, I will have to spend some time to read through the earlier posts. Its just that ARR is such a tremendous inspiration to me....and sitting in the US and watching VTV audio launch videos and the way all the singers were enjoying the occasion and it felt nice with the director giving an insight to the songs, situation etc. Keep making all of us happy with your beautiful singing!!! 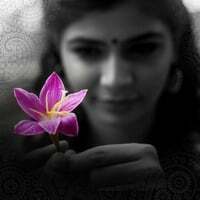 Anyways, I liked it very much... Plz Keep rocking..
Hii Chinmayi.. Just now heard VTV songs... OMG!! as with anyone who loves music and especially from the MASTER... its just left me speechless. Anonymous:If I gush anymore about Mr Alphonse people will think I am obsessed. Right from when I heard the tracks I have been raving about him in my tweets. I think even in the performances he ripped it. He is a super man. And a stupendous performer. And extremely simple and soft spoken, you cant believe it. It was kind of replay of back stage or rather "Making of audio launch". ARR's button episode is cool. May you have enough oppurtunities to laugh out loud like this one,of course taking care of your voice. Thanks for your reply for us. I want to add few more comments. Very Good performance on the stage during the audio launch. We have enjoyed .The Songs Hosana, Omanapenne ,Anbil avan & Vinnai Thandi varuvaaya are very very nice. 'Aaromale ' Song of the Year 2010 ! Never heard a song like this in a while. Thanks for your response ! I happened to note that there are lot of people in the arrahman Yahoo groups who feel the same ... Every one likes it there as well. If you can get the message conveyed to gautham or rahman sir, it would be very nice ! Again, great work it was so nice to feel the song live ! Sreekrishnan: they have already been saying. but lets see. i have always had trouble finding your voice in songs because of the way you sing each song with subtle variations. The audio launch was very nice. Wish every audio release is so pleasant as this one. Was wondering who is going to sing Kalyani madam's part since you were the only female singer ons stage. You surprised us in that song. Good to see the smile after you missed a word or two in the lyrics :-) (probably this is the first time we've seen it). Felt that you were little serious/conscious for the next few minutes..
You were superb in Mannipaya also. Sreenivas in Hosanna was nice. yo chins...nice of u to mention me in th eblog...lik ei said its teh rehearsals ull remember th emost...see u soon for teh telegu launch..enjoy the indonesia gig!!! !